2018(67) Maserati GranTurismo GRANCABRIO MC Convertible. Full Carbon Bonnet. The Car Was Created To Celebrate 100 Years Of The Trident Badge! 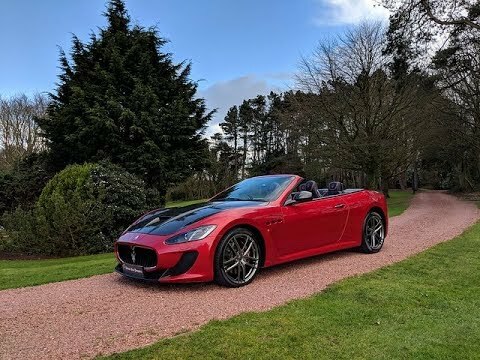 Furness Park are delighted to offer what is one of the most exclusive and stunning Maseratis of recent times, the GranCabrio MC Centennial Edition. Created to celebrate 100 years of the Trident Badge, Maserati have produced this special edition Gran Cabrio which is unrivalled in its performance, power and craftsmanship. Presented in Rosso Magma Red, which in the words of Maserati themselves was designed to achieve the appearance of motion, even when the car is stationary. Applied in three coats, the shade varies subtly depending on the light to reveal deep undertones of purple and blue perfection at 0k/h. The gorgeous Maga Red Paintwork is complimented with a Carbon Fibre Rear Spoiler, Lip Spoiler, Bonnet, Wing Mirror Casings and Door Handles. The addition of the unique Maserati Centennial logo proudly emblazoned on the hubcaps and door sills also pays homage to one hundred years of Maserati excellence. The interior is offered in contrast Black Italian Premium leather upholstery which receives an extra touch of luxury from the unusual white double stitching that defines the profiles of the seats and the central tunnel panel along with red panel inserts to compliment the Maga Red Bodywork. Simply breathtaking! This really is a superb opportunity with just over 8000 miles and a list of optional extras which include 20'' MC Design Alloy Wheels with Bianco Colour Finishing, Carbo Fibre Bonnet, Bose Sound System, Grigio Beluga Soft Top, Wind Deflector, Red Anodised Brake Calipers, MC Design Aluminium Pedals, Comfort Pack for Front Seats, IPOD Connection, Ecochrome Interior Trim, Centennial Wheel Caps, Centennial Door Sills, Carbon Fibre Head Rest Mouldings, Carbon Fibre Door Handles, Wing Mirrors and Front and Rear Spoilers, Twin Exhaust Pips, Satellite Navigation and Red Contrast Stitching. A rare opportunity to own a very exclusive vehicle.